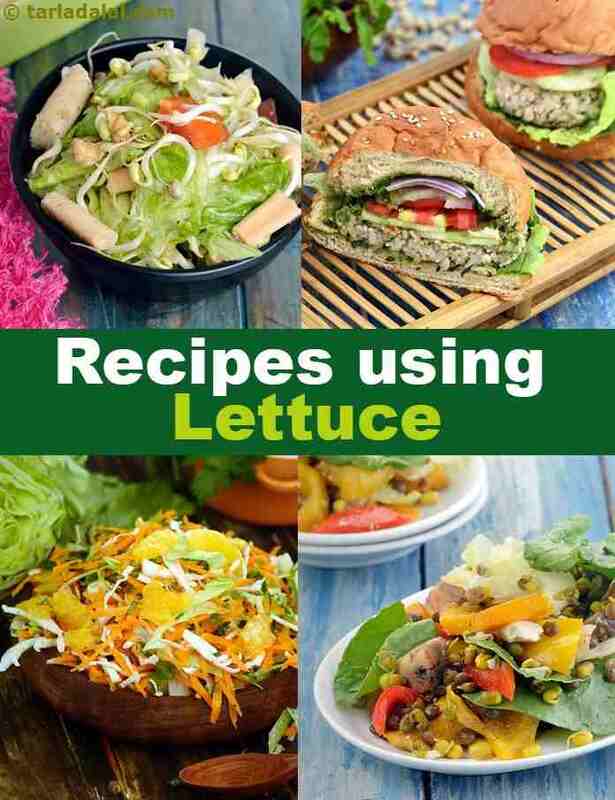 Enjoy our lettuce recipes, Indian lettuce recipes below. Boiled chickpeas, a nice helping of mixed vegetables, a tart, lemony dressing and crisp, garlic-flavored bread croutons are all tossed in together for a lovely, summery salad that will tickle your taste buds. Suggested serving size for 100 calories: 2 wraps make the best use of aromatic basil, tangy lemon juice, spicy dry red chillies and zesty soya sauce in these remarkable lettuce wraps. Antioxidant rich veggies add loads of health as well. Unusually delicious and so easy to make too. Chopped paneer, bean sprouts and veggies are rolled up in small lettuce squares. While that is tempting in itself, the use of ginger and garlic further enhances the flavour of these nutrient dense wraps! You can serve these cups as a salad or as an accompaniment to drinks. Fresh fruits tossed with salad greens and then dressed in a syrupy sweet and spicy dressing is just irresistible!! this healthy combo is bound to add zing to your day! Iron rich lettuce and celery teamed with crunchy apples to raise your haemoglobin levels. Being laced with a vitamin c rich lemony dressing it helps to enhance the absorption of iron further. This fruity lettuce citrus salad is a great combination on fruits, lettuce and citrus dressing, it is very easy to make and perfect for a party. . .